I spent three days at the Namta Art Materials World International Conference and Trade Show at the Orange County Convention Center. The floor was never really packed, but there was a constant flurry of activity at the Stillman & Birn booth. The line of quality sketchbooks were introduced at last year's conference and they must have made an impression. The sketchbooks cost a bit more, but people are realizing that artists are willing to pay more for the quality. Paper matters, feel the difference. When Michael Kalman showed a colleague one of the early sketchbook, he was told, "You hit a home run with the paper." 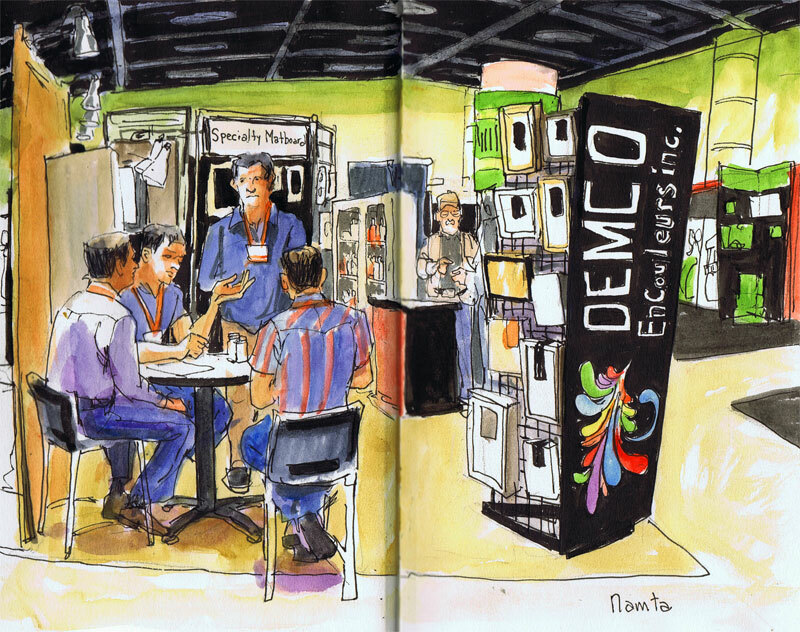 A person stopping by the Stillman & Birn booth said, "This is the year of the sketchbook, I half expect the easel manufacturers to introduce a new line of sketchbooks." This year, Strathmore and Canson both introduced new lines of quality hardbound sketchbooks. These new line of sketchbooks are scheduled to hit stores in July. I went to the Strathmore booth and thumbed through the prototype sketchbooks. A sales manager explained the different lines, paper weights and page surfaces. What really mattered to me wasn't the numbers or convoluted naming conventions, I wanted to see how the paper held up to lines and washes. I already know that the Stillman & Birn books make my work sing so I've developed product loyalty. 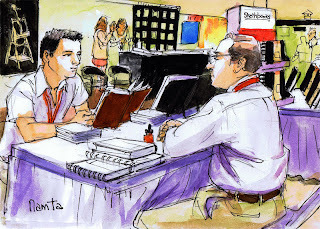 Jason Das, an Urban Sketcher from Brooklyn NY was flown to the Convention by Stillman & Birn so he could work the floor looking for sponsors for the Urban Sketching Symposium in July. Jason stopped by the booth and I got a chance to flip through his most recent sketchbook. I get a visceral thrill from seeing artists sketchbooks. There is no pretense of existential artistic concepts, just raw sincere observation. Another artist named Donald Owen Colley was working at the Faber Castell booth. He uses Faber Castell Pitt brush pens to do his drawings in old ledgers. The book he was drawing in was from the 1860s. The pens are good for putting down warm and cool gray tones. I picked up a few Pitt pens and immediately started playing with them. The bold blacks in this sketch were put down with a black Pitt pen. Owen was hit by a car as he was walking in the International Drive area. Florida almost killed him. There were artists painting and sketching in many of the booths. I felt like a kid in a toy store.